Okay, it took me longer than I thought. I'm not even done yet, really. I simply don't have more time to play around with the design and need to start modeling. The assignment is to create a game model (2,500 polys max) for a game of our choice. We also have to create 3 variations or animations of our model. Oh, the project was also limited to buildings and vehicles; no characters. Being a one time Halo geek, I decided to design a Covenant walker. 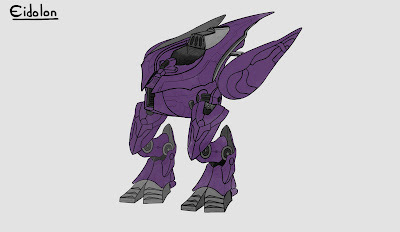 It's approximately twice the height of an Elite, and could be piloted by Elites, Brutes, Marines, and of course Master Chief.